A warm welcome to our most recent new and upgraded members Aberdeen Standard Investments, Acolin, Apex, Axioma, Baillie Gifford, Bain Capital, Credit Suisse, Deutsche Capital Management, Hermes, IFSL, Magellan, PGIM and Sullivan & Worcester. We now represent over 140 member companies from across the funds industry and appreciate your continuing support. 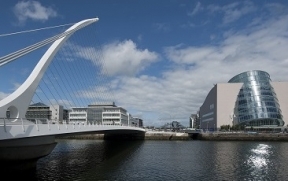 Registration is open for the Irish Funds Annual Conference taking place on Thursday, 23 May at the Convention Centre Dublin. This event attracts a wide range of participants from across the international investment funds community and brings together prominent industry speakers to discuss current issues and challenges facing the industry. The theme this year is “The Future of Funds – Evolution or Revolution?" and will include thought-provoking and informative presentations, keynote talks and panel discussions. Please visit www.irishfunds.ie/conference2019 for more information. Irish Funds conferences and seminars provide significant opportunities for brand exposure and strategic networking among a key audience of decision makers. There are key sponsorship opportunities available for the annual golf event (hole sponsorship, book a 4-ball) on 22 May and for the Annual Conference (exhibition space, coffee break sponsorship, event partner opportunities, advertising in conference programme) on 23 May. Further information on sponsorship of Irish Funds events throughout the year is available on our website. Irish Funds member companies can avail of a 30% discount across all individual sponsorship items. 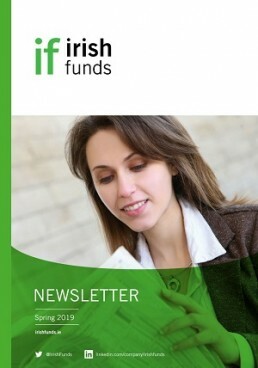 For all enquiries, please email events@irishfunds.ie. The WG has been meeting once a month since late 2018. Over these sessions the group members have explored the focus areas above, gathered feedback from their own firms and determined the immediate focus – enhancing communications and organising targeted events. The WG is currently working on the details of a new role of Communications Champion and will be asking each member firm to nominate someone to take on this role. This is a great opportunity for younger employees to get involved. We are also designing a Lunch & Learn session to educate employees in member firms on the resources available to them within IF and the benefits they can avail of through engagement with IF. Further updates on these and other initiatives will be provided in due course. If you would like to learn more in the meantime, contact Alison Manley at Alison.L.Manley@Goodbody.ie. Irish Funds continues to be shaped by its members needs as part of a thriving funds and asset management ecosystem in Ireland, grounded in government support, clear regulation, product innovation and exceptional talent. This requires us to adapt our service model and resourcing in terms of our growing and changing membership base. The current Irish Funds Working Groups, successfully operating since Q3 2017 has grown in stature, number of groups, member firm participants and most significantly in terms of mandate. This working group structure has been an invaluable industry resource, successfully delivering on industry priorities and concerns. We are in the process of re-constituting the structure, the groups and the associated participation for our members during Q1 2019 to allow it to best serve both ongoing industry initiatives and more recent strategic priorities underpinning our goals of influencing, promoting and servicing the needs of our diverse membership. (Expected live date in Q2 2019.) Diversity and inclusivity are very important to Irish Funds, in enhancing the quality and rigour of the working group structure we strive to actively encourage higher diversity across the membership of our groups. As an industry, we are also embracing sustainability, and this will feature to a greater extent in our work during 2019.